Agile Management- CSD Certification Dubai One of the most popular destinations for travel and business is Dubai which is the known for its luxurious lifestyle coupled with huge shopping destinations. Another important aspect is the desire to enrich its educational aspirations for the city?s youth to shoulder responsibilities of maintaining and furthering development in the field of technology and computer sciences. With revenues generated from tourism, Dubai is poised to offer latest educational techniques in a bid to promote its economic growth. What is the course all about? KnowledgeHut is a globally registered, e-learning provider for Scrum Alliance. The CSD certification in Dubai is a course charted out to meet the requirement of IT professionals, architects and business analysts along with engineers among others to help them with their continuous improvement and commitment to understand the specialized technical knowledge of agile management. With the help of workshops, aspirants will be able to understand scrum principles alongside gaining a strong hold of Agile engineering skills. Benefits of the course: CSD training in Dubai is a very meticulously drafted program for individuals seeking to specialize in their respective fields. The course is conducted by professionals in their spheres of competency. The methodology comprises of Certified Scrum Developer training in Dubai where a customized workshop supported by demos and practice sessions come in as learning aids for students. Each session is supported by study material to understand the lectures and clarify any ambiguities. 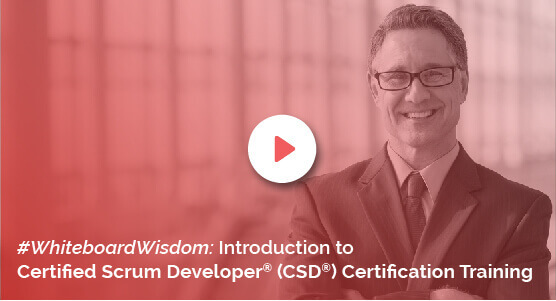 This way, the Certified Scrum Developer certification in Dubai handholds students to be absorbed in well-paying jobs through the comprehensive knowledge gained after the completion of the CSD course in Dubai. The KnowledgeHut Way: An experience and highly dedicated team ensures that the coaching is given in a systematic manner. Tagged with an affordable course fee, this course brings in the convenience of completing it easily, balancing the work-learning schedules of students and working professionals.